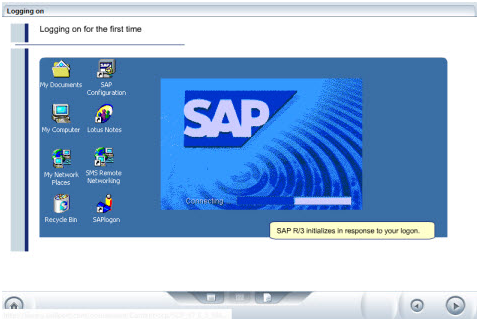 This tutorial is designed for existing SAP R/3 users who are upgrading to Release 4.6. The training tutorials will teach the student to log on to SAP R/3 Release 4.6, manipulate the user interface, navigate the system, and create and configure a favorites list, as well as change a password. In addition, it instructs the student how to work with tasks and to describe some of the updated screens. Customize the logon menu, and change a password. Log on as an end-user and change a password. 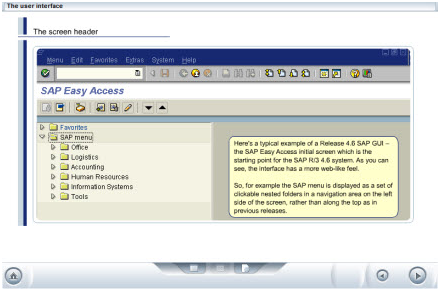 Components of the SAP user interface and explain their functions. Change the appearance of various elements of the SAP interface. Create a shortcut from the desktop and from an open screen. Function of the Favorites folder and move, rename, and delete items in the folder. User and SAP menus to find transactions. Fields and input, change, and save data. Create a purchase order using Release 4.6. Print a variety of documents in SAP R/3 Release 4.6 and select their output settings. New Release 4.6 interface features and the changes in the Materials Management module. New interface changes associated with sales orders and customer master records. Fundamental changes that have occurred in the Service Management module in the move to the new Release 4.6 graphical user interface. Display vendor master records, enter a vendor invoice, and display vendor line details. SAP R/3 Release 4.6 supports a business environment. SAP customization and system-wide concepts, and describe the reporting and archiving tools. Business Framework simultaneously enables independence and integration for applications. Financial accounting processes for both internal and external accounting requirements. Functions of the Plant Maintenance, Project System, and Service Management modules. SAP R/3 Release 4.6 both connects a business to the outside world and integrates its internal processes.